One of the most significant seasons in Tottenham�s 136-year history is up and running with a satisfactory three points from the opening match at Newcastle � but much more important (I am sort of joking) is that the Spurs Odyssey Quiz League kicks off today! This is the fifth year of the League and I wonder if Quiz King David Guthrie can complete a hat-trick of victories. That�s him above collecting his 2017-18 framed certificate from me � I am the skinny, good-looking one on the right. David, from Wokingham in Berkshire, was our inaugural winner and regained the title last season, He is one of those omniscient know-alls who make you sick; a walking record book not only on Spurs but also on such diverse subjects as steam trains, World War Two, American politics and rock bands of the 1960s (well, at least his idols Hank Marvin and The Shadows). No accounting for taste. There are two other former champions who have put up a strong challenge each year, and both are lawyers: Glen Scarcliffe, from Hampstead, and British-born American attorney Edward Benson, the 2017 champion from New York via North London. Who wore the No 9 Tottenham shirt in an FA Cup winning team, and which Spanish club did he later manage after playing for Las Palmas and Sevilla? 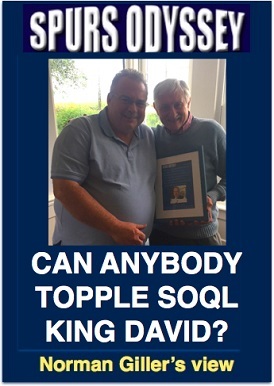 Please email your answer to me at SOQL1@normangillerbooks.com. Deadline: midnight this Friday. I will respond to all who take part. Last week I asked: Who was a youth footballer for Spurs, played in Sweden, later returned to Tottenham, scored 22 goals in 44 international matches and holds the record for most headed goals in the Premier League? Yes, the human stepladder Peter Crouch, who has always been a credit to the game in his long career that continues with Stoke City. Saturday�s result: Newcastle 1, Tottenham 2, Moaners and Groaners 0. I could not believe the choruses of criticism that followed a victory in which, yes, Spurs rode their luck. Here we are on the brink of moving into a state-of-the-art stadium that will be the envy of fans across the country, and in a position to become one of the world�s great clubs. Yet the mood among many fans is one of despondency. Our guru Paul H. Smith takes a balanced view of the match HERE, and just describes what happens in the game without trying to pretend he knows better than Mauricio Pochettino how to run the team. I cannot understand why so many so-called supporters take swipes at their own players instead of encouraging them. They should save their vile abuse for the opposition rather than firing it at players wearing the Lilywhite shirt. They need lessons from Paul Smith how to watch BOTH teams. Dele Alli was voted Man of the Match by the TV pundits, but my vote would have gone to Jan Vertonghen, who was immaculate and marked his precision performance with one of history�s stranger goals. Hawkeye showed his header crossing the line by just 6 mm, which in old money is 0.23622 inches. That goal should go down as "assist Modern Technology." It�s going to be a long, hard � and historic � season. Let�s all try to adopt Pochettino�s three Ps: Positivity, positivity, positivity. Pessimism is contagious and can eat into the very soul of the club. Tottenham have a fantastic squad and will again be up there chasing the title, but anybody who is being realistic can see that money-no-object Manchester City have the strongest all-round team. Spurs have spent the little matter of �850m � some say a billion � on the new ground. Joe Lewis and Daniel Levy believe in balancing the books, and resisted buying for the sake of it during the transfer window. That�s not �tight and miserly�. That�s sensible. The couch coaches say they should have bought an understudy for Our Harry Kane. I always ask the critics to name exactly who they have in mind, and whether they realise that strikers do not grow on trees and those that are of any quality cannot be persuaded to come and play second fiddle. With the Fulham match at Wembley coming up on Saturday, let�s � I�ll say it again � get behind the team, not in its way. AFTER his bruising as a failed TV commentator in the United States, Danny picked himself up, brushed himself off and got on with his life as an outspoken sports columnist, his pen often dipped in poison as he continued his vitriolic attack on the football establishment. He tried hard to hide his disappointment when Tottenham�s great North London rivals Arsenal repeated the Double feat ten years after he had led Spurs to the League championship and FA Cup. Danny, who could be witty, wise and weird in equal measure and all within one thought process, prided himself on never ducking a question, but on this occasion he was unusually prickly. �All right, what do you know?� he asked. �I�m sworn to secrecy.� Purely by coincidence I had stumbled on a developing story of major proportions. There was a long silence, which was a rare thing when talking to Danny, because he liked to fill every waking moment with original ideas and unique observations. To wind him up, I used to call him Danny Blarneyflower. This was a coffee house near Blackfriars� Station, a short walk from Fleet Street. It was years since it had been owned by former Arsenal star Alex Forbes but was still known to football journos by his name. It was the sort of nondescript place where you could melt into the background while meeting contacts. There was a touch of a John Le Carr� spy thriller about Danny�s entrance into the coffee house. He was looking around furtively as if making sure he had not been followed. �What�s with all the cloak and dagger stuff?� I asked. The newspaperman in me was aching to get that sensational story into print, but Danny had tied me into a straitjacket of secrecy. It was a month before Nicholson�s stunning decision to quit became public, and the veteran manager made no secret of the fact that he wanted Tottenham icon Blanchflower to take over from him. He had even teed-up ex-Leeds playmaker Johnny Giles as player-coach. �It can only end in tears. Terry is an intelligent man with lots of bright ideas, but he has as much chance of being accepted at Tottenham as the Archbishop of Canterbury has of being welcomed at the Vatican. He is Arsenal through and through. �Danny was perfect for the job. He knew the traditions and the ways of Tottenham, and would have slipped into my shoes comfortably and with style. The fans and the players would have welcomed him with open arms. He had Spurs in his soul. I have never been so embarrassed in all my life when the Board totally ignored my advice and just refused to consider Danny. I thought that after all my service to the club I was entitled to think I could give guidance as to who would be right to take over. But they appointed Terry Neill without consulting me. I would have been happy to stay on and advise Danny, without interfering. He has always been his own man, but I know he would have been willing to listen to me when there was any situation with which he needed my considerable experience. What cowardice by the Tottenham directors, and in particular chairman Sidney Wale. These were the men who had allowed Bill Nicholson to drive himself into the ground in the service of Spurs without once paying him a decent wage. Now they were slapping him in the face by ignoring his advice as to who should be his successor as Tottenham manager. That was tame compared with what coach Eddie Baily, star schemer with the Push and Run champions, had to say when he was given the tin tack when Bill decided to leave, and he lambasted the directors for the rest of his life. These little men were frightened that Blanchflower would dictate to them, as he would have done. Instead they went behind Nicholson�s back and chose another Irishman who was totally unsuitable for the job. Terry Neill�s heart always belonged to Highbury. They got the wrong Irishman. How Irish is that? Disillusioned and embarrassed, Danny returned to his journalism, but the time was about to come when he would get the call to return to the game he loved. It was a call to which he should have turned a deaf ear. Danny was the peoples� choice when he ended his wilderness years out of football and became Northern Ireland manager in 1976. One of the main magnets for Danny was that the magician George Best was into a good place in his roller-coaster career, showing flashes of his old flair in what proved a winding-down period with Fulham. But all he got was George�s shadow. Danny�s return to the football arena raised his profile, and fleetingly in the autumn of 1978 Northern Ireland topped their qualifying group in the European championship. It was a flattering and deceiving position. He convinced himself he had what it takes to be a full-time manager, and he could not resist when Chelsea came calling with the offer of boss at Stamford Bridge in December 1978. He agreed to combine the Chelsea and Northern Ireland jobs, little knowing that he was sentencing himself to the most depressing nine months of his footballing life. He did not like my observation that this appointment was as daft as Terry Neill being made manager of Tottenham. Chelsea, deep in debt, had been labouring under the management of their former right-back Ken Shellito, and were fielding their youngest squad of players since the 1950s days of Ted Drake�s Ducklings. For years Danny had charmed Chelsea chairman Brian Mears with his romantic views of football, because he had been one of the Blanchflower set and they were good friends. Now Brian, whose family had founded Chelsea in the early part of the 20th Century, wanted him to provide action to go with his words and take charge at Stamford Bridge. It was to prove a Bridge too far. Club football in 1978 was like another planet from when Danny was at the peak of his playing powers. Players much less talented than the former Tottenham club captain were earning huge wages compared with what he had been paid. He had never collected more than �20 a week from playing until his last two seasons. He found himself having to deal with young, long-haired, fashion-conscious Kings Road-minded footballers with flared trousers and wide lapelled jackets. They were the trend setters of the day, and they liked to party and most of them enjoyed a good drink, which was something teetotaller Danny never got involved with. The Chelsea squad he inherited was a mix of veterans like Peter Osgood, Ron �Chopper� Harris and Peter Bonetti, and young, inexperienced unknowns under the captaincy of 21-year-old Ray �Butch� Wilkins. Sadly for Danny it was a total disaster that could be measured on the Richter Scale. Chelsea won only five of 32 matches on their way to relegation in 1978-79, and a completely humiliated Blanchflower threw in the towel after just nine months. �Right place, wrong time. Suddenly I found myself not being able to talk the same language as the players. I thought I was making sense, but they couldn�t understand me and were unable to translate what I was trying to convey into action on the pitch. I tried to take the Bill Nicholson route, keeping things simple. But even when I was A-B-C-ing it they did not get the message. It dawned on me that there was too big an age difference between me and the players. It needed a younger manager to get hold of the Chelsea lads and motivate them. Ten years ago it would have been a different story. We talked a different language then. The game has changed out of sight. For most of my career we were not paid enough, and players were treated like cattle. Now it has gone too far the other way. They are getting lots of money and in many cases for little effort and minimal skill. Danny and the Beautiful Game that he played so beautifully had become passing strangers. Once he had accepted that his flirtation with football management was over, Danny retreated to his comfortable former life of writing for the Sunday Express and golfing at Wentworth. He was happy that he had satisfied his curiosity about the challenge of being a manager, sad that it had proved such a confusing and ultimately humiliating adventure. Now he was ready to accommodate what he always knew was the lazy man deep inside him. A couple of thousand words a week and a game of golf every other day. How bad could that be? But the gods, fate � call it what you will � were conspiring against him in the ugly shape of a slow, painful decline in his health. It started with the approach of crippling arthritis that forced him to give up the game of golf that he loved even ahead of football. He penned his last column for the Sunday Express in 1988 as it became obvious to his sub-editors that he had lost his great powers of reasoning and any grip on what was happening on the modern football front. The village world of football soon buzzed with gossip about Danny�s deteriorating condition, both in his health and his finances. Northern Ireland manager Billy Bingham, Danny�s former international teammate, contacted Tottenham boss Terry Venables, and they hurriedly put together a testimonial match between Spurs and a Northern Ireland XI at White Hart Lane on 1 May 1990. It was all done helter-skelter and the game squashed between the end of the season and the approaching World Cup finals in Italy. Paul Gascoigne, the new darling of the Lane, was the star of the show, and he greeted Danny with a huge kiss on the forehead when introduced to him before the game. Danny looked suitably bewildered. A crowd of just under 7,000 turned up to watch goals from Gazza and David Howells lift Spurs to a 2-1 win, with Ossie Ardiles coming back to the Lane from Swindon to lend his talents to a night of nostalgia. The important thing is that it brought Danny a �40,000 financial boost to help him with his debts and what were now care costs. A few months later I visited Danny, hoping to do our usual piece together on the anniversary of the 1960-61 Double triumph. I thought that talking about great days gone by just might give him a lift. It was with deep sadness I found that not only could he not remember me, but his memory had been wiped clean of all that he had achieved in his glittering football career. He was into the early stages of the Alzheimer�s disease that tragically made the last few years of his life a blank. To add to his misery he suffered Parkinson�s Disease, and there was a fall at home that needed emergency hospital treatment. Those close to him were relieved that it was downhill quickly from there. The torture finally ended when he passed on at Cobham Nursing Home in Surrey on 9 December 1993, aged 67. When I first approached Danny to tell him I was writing a book about him he made it abundantly clear that he did not want me to chronicle his life and footballing times. 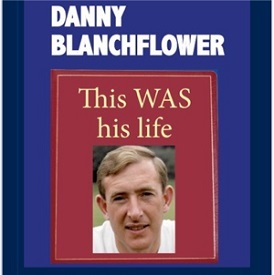 I made the presumptuous remark that I wanted to write about the REAL Danny Blanchflower. Only you can judge whether I got anywhere near him in what has been an unashamed tribute to a great footballer and raconteur who could charm the birds down out of the trees and then get them to sing. But the REAL Danny Blanchflower? I don�t think even Danny ever got to know exactly who that was. Let�s just agree they threw away the mould when they made him. We will never see his like again. He was unique. An artist in football boots. Danny Blanchflower, this WAS your life.